Price Chopper: $0.50 Good Thins + New Horizon Coupons! 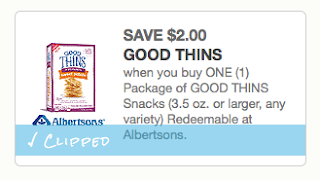 High Value GOOD THINS SAVE $2.00 when you buy ONE (1) Package of GOOD THINS Snacks (3.5 oz. or larger, any variety) Redeemable at Albertsons. Print (NLA) - on sale for $2.50 at Price Chopper = $0.50!